2010 Ideal re-branding of classic Hands Down card game. From the box: "Play with friends in this quick action card game! Deal the deck to make pairs. Make a pair and "slap" you paddle! 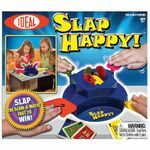 Be the last person to "slap" and lose a card! The person with the highest point count at the end is the winner!!!"